Marine medaka Oryzias dancena, a candidate model organism, represents many attractive merits as a material for experimental transgenesis and/or heterologous expression assay particularly in the field of ecotoxicology and developmental biology. In this study, cytoskeletal β-actin gene was characterized from O. dancena and the functional capability of its promoter to drive constitutive expression of foreign reporter protein was evaluated. The O. dancena β-actin gene possessed a conserved genomic organization of vertebrate major cytoplasmic actin genes and the bioinformatic analysis of its 5′-upstream regulatory region predicted various transcription factor binding motifs. Heterologous expression assay using a red fluorescent protein (RFP) reporter construct driven by the O. dancena β-actin regulator resulted in stunningly bright expression of red fluorescence signals in not only microinjected embryos but also grown-up transgenic adults. Although founder transgenics exhibited mosaic patterns of RFP expression, transgenic offspring in subsequent generations displayed a vivid and uniform expression of RFP continually from embryos to adults. 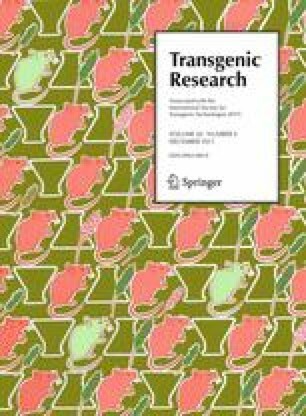 Based on the blot hybridization assays, two transgenic lines established in this study were proven to possess high copy numbers of transgene integrants (approximately 240 and 34 copies, respectively), and the transgenic genotype in both lines could successfully be passed stably up to three generations, although the rate of transgene transmission in one of the two transgenic lines was significantly lower than expected Mendelian ratio. Significant red fluorescence color could be ubiquitously observable in all the tissues or organs of the transgenics. Quantitative real-time RT-PCR represented that the expression pattern of transgene under the regulation of β-actin promoter would resemble, in overall, the regulation of endogenous β-actin gene in adult tissues, although putative mechanism for competitive or independent regulation between transgene and endogenous gene could also be found in several tissues. Results from this study undoubtedly indicate that the O. dancena β-actin promoter would be powerful enough to fluorescently visualize most cell types in vivo throughout its whole lifespan. This study could be a useful start point for a variety of transgenic experiments with this species concerning the constitutive expression of living fluorescent color reporters and other foreign proteins. The online version of this article (doi: 10.1007/s11248-011-9501-2) contains supplementary material, which is available to authorized users. This study was supported by a research fund from the Ministry of Land, Transport and Maritime Affairs, Korea (Project # 20088033-1).